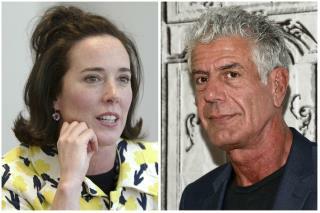 (Newser) – Calls to suicide hotlines have spiked dramatically since the deaths of Kate Spade and Anthony Bourdain—not an unusual phenomenon in the wake of celebrity suicides. The Wall Street Journal reports on a 25% uptick at the National Suicide Prevention Lifeline (1-800-273-8255) since Spade's death, while USA Today attributed a similar rise to both celebs, and a New Jersey hotline experienced a 70% increase in calls Friday morning. "We're so extremely busy," says Rachel Larkin, who heads a crisis-prevention center in Maryland. "I think we’re all worried. ... Both Kate Spade and Anthony Bourdain are people a lot of people related to." The top ten states are more of the Northern states and where people are few. People that has no one to hug, hold hand, talk to tend to let the flesh or imagination take over. Introspection can be deadly serious. Celebrities and rich or proud people have very few lifelines. They are the loneliest people because they have to keep the show on the outside with inside tortured. They have to look tall under the devil's clutch. And when their last lifeline is cut, they are in free fall. Take a walk in the mall, go to a church. Sit in a Starbuck. At least it would stop your random thought in your flesh if only for a wtiching hour. Suicide, aka Trumpcare, is now becoming more popular as republi-can't$ have removed most Americans access to healthcare, which includes mental health care. To save your sanity and possibly your life, vote them out this November.